Sit right back and you’ll hear a tale — not of a fateful trip, but of an escape from reality, your own three-hour tour. 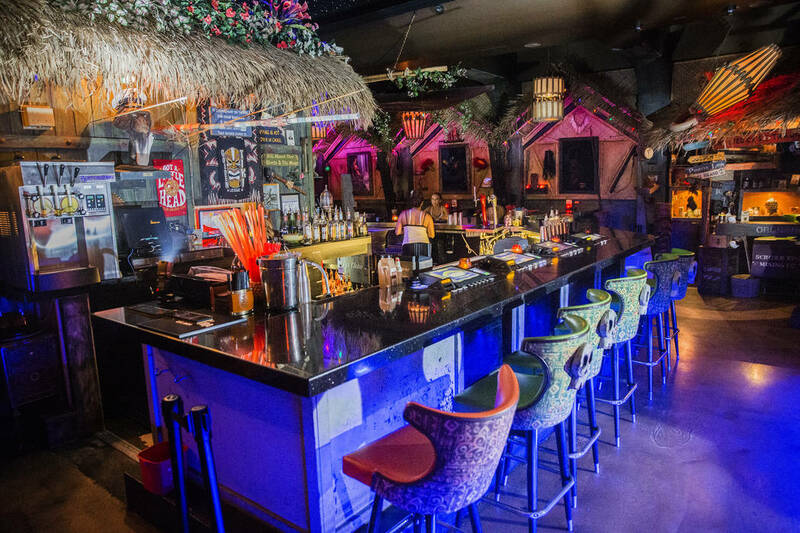 It comes by way of tiki culture, which had disappeared from Las Vegas but came roaring back thanks to Frankie’s Tiki Room, which is approaching its ninth anniversary, and The Golden Tiki, which just marked its second. But while the two spots share a clear appreciation for all things tiki, they’re really about as dissimilar as a toddler and an almost-tween could be. Frankie’s filled a void that was absolute. Tiki tradition started in Las Vegas in the ’60s with Aku Aku at the Stardust and Don the Beachcomber at the Sahara, but both closed in the ’80s. Taboo Cove, The Venetian’s attempt to revive the genre, lasted only from 2001 to 2005. Enter P Moss, owner of the Double Down, the venerable Paradise Road dive bar. While Moss said he “wasn’t a fanatic or anything” in regard to tiki culture, he knew a niche when he saw one.